Nearly every depressed person is assured by doctors, well-meaning friends and family, the media, and ubiquitous advertisements that the underlying problem is a chemical imbalance. Such a simple defect should be fixable, yet despite all of the resources that have been devoted to finding a pharmacological solution, depression remains stubbornly widespread. Why are we losing this fight?In this humane and illuminating challenge to defect models of depression, psychologist Jonathan Rottenberg argues that depression is a particularly severe outgrowth of our natural capacity for emotion. In other words, it is a low mood gone haywire. 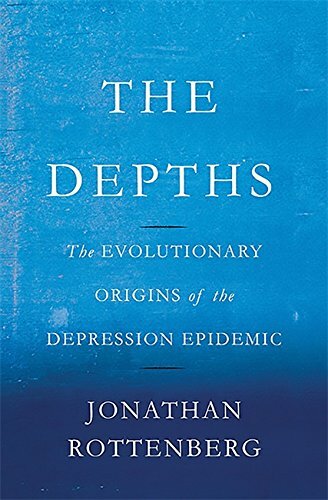 Drawing on recent developments in the science of mood,and his own harrowing depressive experience as a young adult,Rottenberg explains depression in evolutionary terms, showing how its dark pull arises from adaptations that evolved to help our ancestors ensure their survival. Moods, high and low, evolved to compel us to more efficiently pursue rewards. While this worked for our ancestors, our modern environment,in which daily survival is no longer a sole focus,makes it all too easy for low mood to slide into severe, long-lasting depression.Weaving together experimental and epidemiological research, clinical observations, and the voices of individuals who have struggled with depression, The Depths offers a bold new account of why depression endures,and makes a strong case for de-stigmatizing this increasingly common condition. In so doing, Rottenberg offers hope in the form of his own and other patients' recovery, and points the way towards new paths for treatment. "It's rare to come across new ideas on the nature of emotion. Drawing on his own groundbreaking research and the best science available, Rottenberg unravels some of the mysteries of depression. Why is it so common? Why is it so resistant to treatment? How does a normal bout of sadness transform into deep depression? This beautifully written book offers wisdom and hope. "―Todd B. Kashdan, Associate Professor of Psychology, George Mason University, and author of Curious?